“Come, we go. Look at da weather out dare. It perfect,” said Darlusz Zabagaiski, the Polish frog who lifes here and is always instigating a project. 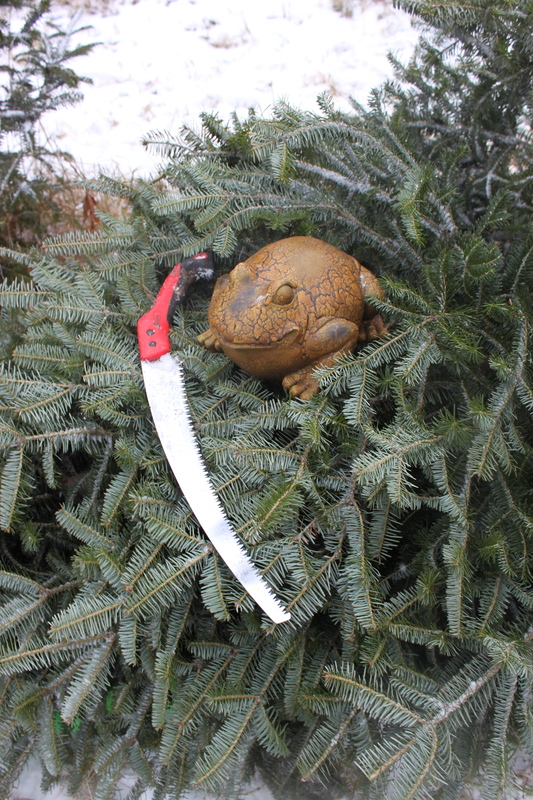 Darlusz the frog claims a Christmas tree for the house at the Bakersfield Tree Farm yesterday. Darlusz said this yesterday morning, a Saturday. It was a gray and cold Vermont morning. Fine snowflakes drifted down, and the wind pushed some of the snow off the roof in white, bone chilling swirls. I looked out the window and shivered. “You’re crazy. It’s a good day to stay inside and have some hot chocolate,” I said. Success! Darlusz has finished cutting our Christmas tree. I knew I wouldn’t win this argument though. So I listened to Darlusz’ pitch. “See, it the first Sataday in December. It, what you say, snieg out dare,” he said, using the Polish word for snow. “It perfect. We go get Christmas tree,” he said. So Jeff, Darlusz and I piled into the truck and headed up the hill to the Bakersfield Tree Farm , a nice cut -your-own Christmas tree place in picturesque Bakersfield, in northern Vermont. Darlusz was so excited when we got to the farm he practically hopped out the truck window before I stopped. “Get da saw. Hurry!” he said. He hopped out into a big field of Christmas trees and disappeared. Jeff and I turned up our coat collars against the snow and trudged through the rows of green trees. I had to admit the place smelled great. 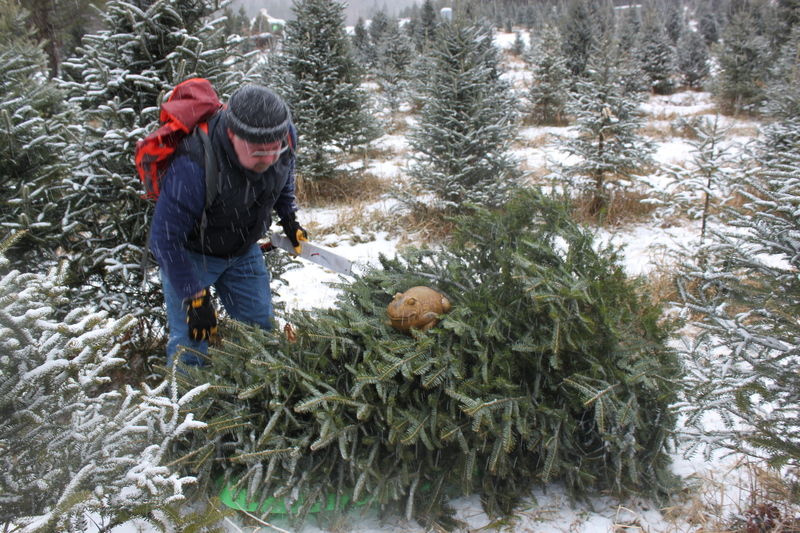 Jeff arranges the tree on a sled to drag it back to the car while Darlusz rests in the branches after cutting the tree. Jeff and I saw some trees that seemed like good candidates for the house, but we heard Darlusz behind a row of trees deep in the field. 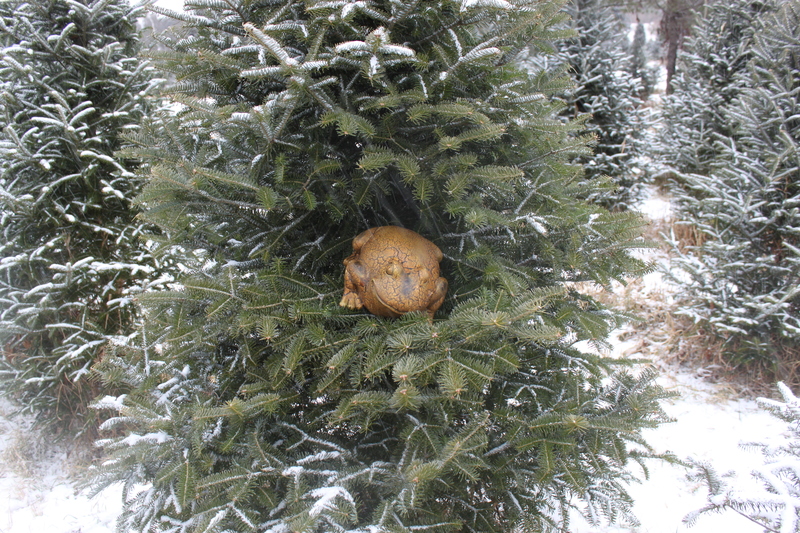 He was sitting in the tree, testing the branches, making sure they were full and sturdy. “See, dis Choinki,” he said, using the Polish word for Christmas tree. As I said, there is no arguing with Darlusz, so I handed him the saw and told him to get to work. In no time, Darlusz had the tree cut down. We put it on a plastic sled the farmer gave us to haul the tree back to the truck. “I tired all that sawing. I sit on da sled, too,” he said, plopping himself down in the tree’s branches, atop the sled. So we dragged the tree, and Darlusz back to the truck. I have to admit it was a nice excursion. The bracing air, the dustings of snow falling from the sky and lacing the trees, and the Christmas-y smell of balsam made me happy, despite the chill. Next up: Getting stuff to decorate the tree. I can hear Darlusz planning already. This entry was posted on December 5, 2010 at 12:44 pm and is filed under Uncategorized. You can follow any responses to this entry through the RSS 2.0 feed. You can leave a response, or trackback from your own site. Can I borrow Darlusz so he can help me get a Christmas tree too?